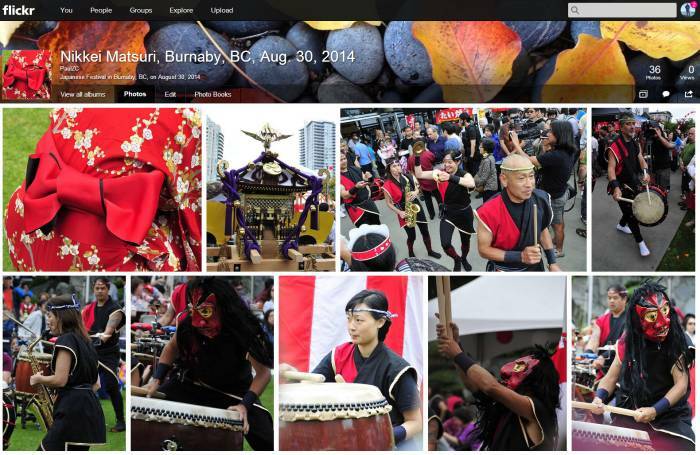 Yumi and I had a great time at the Nikkei Matsuri today, just up the hill from our place at Nikkei Place. Great music, displays, food, and culture, with a wonderful family-friendly crowd. It’s on tomorrow, too! Here’s my Flickr set from today. I am typing this on my new Windows 8.1 tower computer, a custom box I configured and bought from NCIX in Burnaby, BC. As mentioned in previous posts, my Windows 7 tower suffered a bad bout of malware awhile back that took several anti-virus programs and some manual tweaking to clean up. It was starting to show its age, anyway, and some tasks like video editing were very slow with its 6GB of RAM and a 512K video card. The new machine has 16GB of RAM and a 2GB video card, along with an 8-core 3.5GHz processor, so that should make an appreciable difference. I haven’t found Windows 8.1 to be as much of an interface challenge as I had feared. I’d read horror stories about folks complaining about the Windows 8 touch/tile interface, but 8.1 has made it easier to go back to an interface relatively familiar to users of Windows 7 and previous versions. I’ve already got Office 365 installed, and a few favorite apps that I use daily, such as ClipMate, Evernote, and IrfanView. I have yet to get many programs installed such as the Adobe Suite, etc. I’ll chip away at it bit by bit over the next few days, while keeping the old box running side by side on the network. I also need to transfer all my files and photos, but I’ve got all those synced to a NAS (network attached storage) unit on my network anyway. 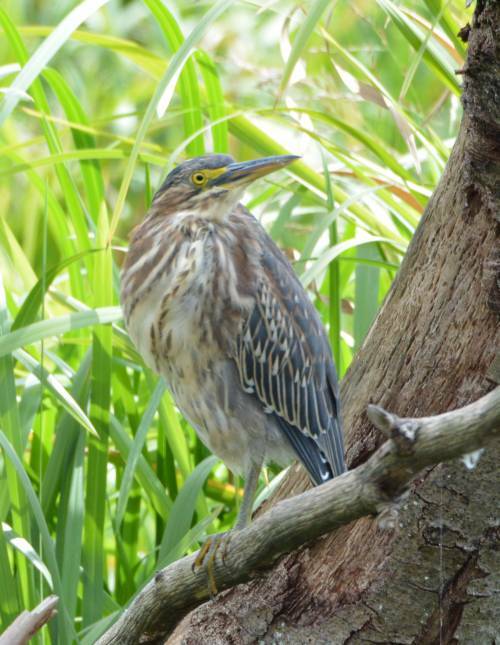 Several photographers were excited about this Green Heron, at Piper Spit at Burnaby Lake, in Burnaby, BC, today. 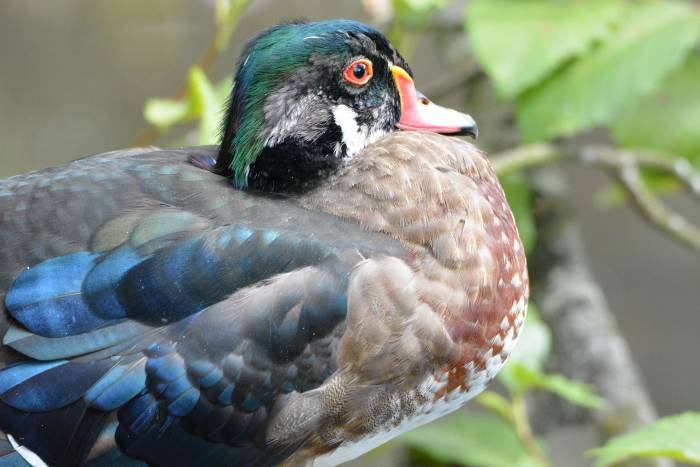 Wood ducks are gorgeous — males so flamboyant, females pretty, both sexes shy. Here’s one from Piper Spit at Burnaby Lake today. I had an errand to run in north Burnaby, so I brought the camera along for a stop at the lake on the way home. Shoot shoot shoot. You learn by doing, so do. Take photos from different angles, try different exposures, move closer up, move farther away. Experiment with faster and slower shutter speeds, and larger and smaller apertures. Try some at wide angle, try some at telephoto. Try some with flash, some without. Try fill-in flash. If you don’t want to lug a DSLR around all the time, carry a pocket camera all the time and take photos here, there, and everywhere. Practice gets you closer to perfect. In the old days of film, every shot cost. Cost for film, cost for developing, cost for printing. The first two costs are now minimal, though you can still spend a lot on printing. With digital, you can take thousands of photos for less than a penny to at most two or three cents per shot – and those pennies are reusable. On a 24-megapixel camera set to RAW + JPEG, 32GB gets you over 700 shots. So fire away, and then delete and edit later. This is not to say that you should mindlessly bang away on your shutter button. You should still compose and expose each photo as best you can, just don’t be reticent about taking lots of different views with different settings. I’m a bit leery about buying off-brand batteries. Sometimes they work well, sometimes they’re junk. But with a replacement Canon NB-9L battery running 74.99, yikes! That’s nearly half the price of buying a new mid-range Canon Elph camera! So I think I’ll take my chances with a no-name equivalent battery for, get this, $7.83. For that price, it’s certainly worth trying. 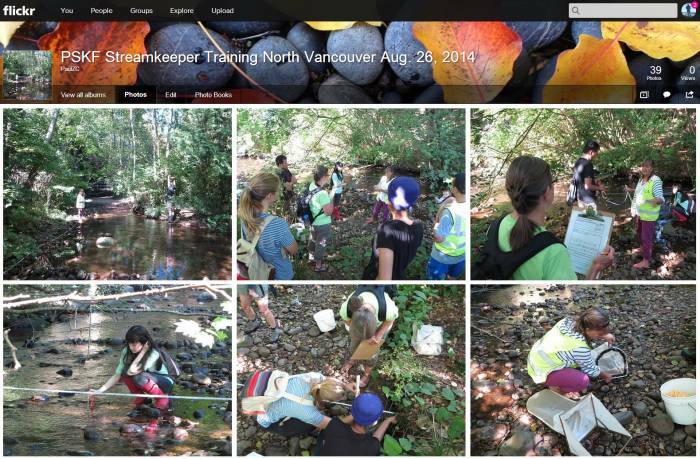 I attended a one-day streamkeeper training course in North Vancouver hosted by the Pacific Streamkeepers Federation. We covered modules 2, 3, and 4 from the Streamkeepers Handbook. I figured it was about time I had a refresher, since it must be around ten years ago that I originally took the training. It was a lovely, sunny day, and a great group of people. You can check out some photos I took in this Flickr album. A couple of years back I installed a dual-flush toilet in our basement bathroom, and it’s worked well. So recently we began keeping an eye out for dual-flushers on sale, and spotted a model that we liked at Lowes on sale from $269 to $169. We bought two, for the upstairs bathrooms. Today I installed one, and by the time I was done, I was soaked with sweat. It’s not that hot, but it must be humid, because by the third trip up/down the stairs from the garage to the top floor, I was dripping. Disconnected, disassembled and hauled down an old toilet, and carried up, assembled and connected a new one. Thought one was enough for today, as I have to be careful with my fused back. Do the other one later in the week. 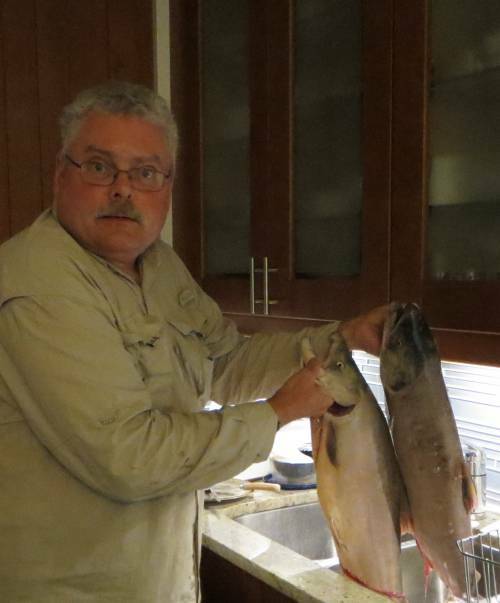 Caught two sockeye on the Fraser River today – the recreational daily limit. Large one just over 7-1/2 pounds, smaller one about a pound less. Cut the bigger one into two “roasts” and a couple of fillets, and the smaller one into cross-cut, bone-on-center, inch-thick steakettes for salting and freezing for Japanese-style broiled breakfast pieces. Thank you sockeye for your sustenance. And thanks to my cousin who invited me out in his boat, rigged me up properly, and taught me how to bottom bounce for sockeye! Our Shaw home phone VOIP system died in mid-conversation this evening. Just cut out in mid-call, and all of the phones connected to it had no dial tone. My Shaw business phone on a separate box was fine, as was our Internet connection. So I figured it had to be something with the home phone modem. I did the unplug-the-power-pull-the-battery routine twice, to no effect. I did a system reset twice, to no effect. I plugged a phone directly into the box, and got a dial tone. Hmm. I unplugged all our phones and plugged them all back in again. And just as weirdly as the problem arose, it disappeared. I’m happy that I “fixed” the problem, but I’m unhappy because I don’t know what it was that fixed the problem. Yep, since I stopped posting to my old blog, and started this new blog on July 5, 2014, every single “comment” has been spam. That’s why I never had comments open on my old blog on an aging software architecture. So what the heck is the purpose of comments, if they are ALL spam? UPDATE: August 25, 2014. I have turned off comments on all previous posts on this blog.